The Beyond Success – Significance Campaign will raise money for everything from academics to building projects, including the ongoing renovation of the Carlton Union Building, above. 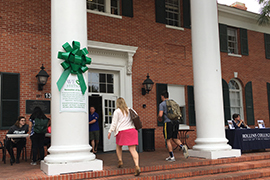 Green bows and signs are appearing around campus this week to show the importance of philanthropy. Stetson University’s Beyond Success – Significance Campaign has surpassed the $100 million mark as bows and tags start appearing around campus this week to raise awareness about the impact and importance of philanthropy. Jeff Ulmer, Vice President of Development and Alumni Engagement, said the comprehensive campaign last month reached $100 million toward its goal of $150 million. The money will be used for new facilities, student support, such as scholarships and fellowships, and academics, including faculty research. 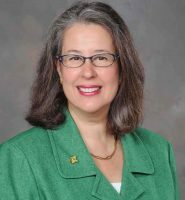 Stetson President Wendy B. Libby, Ph.D., called the $100 million mark a “milestone” for the comprehensive campaign, which will invest in and improve all areas of the university – academics, student life and success, athletics and buildings. It also serves as a “check-in point” to make sure the campaign is on schedule and determine if the priorities have changed. As of March 3, the campaign had reached $106,046,267. Ulmer said the fundraising effort is a little ahead of schedule and he believes the college will reach the $150 million goal by June 2019. Over the next two weeks, signs and green bows will go up on buildings around campus, giving faculty, students and staff an idea of the initiatives funded by private donations. “We Love Stetson” signs will appear this week and also say thank you to faculty and staff for their efforts in these fundraising initiatives. “We Love Stetson” signs are appearing on campus this week to thank faculty and staff for their efforts in the fundraising initiatives and to show the impact of philanthropy at Stetson. Faculty and staff are invited to free Pie Day on Tuesday, March 14, from 2:30 p.m. to 4 p.m. in the Rinker Welcome Center with a selection of pies, as well as coffee and tea. There will be opportunities for faculty, staff and students to donate to the campaign, but “it’s not about the dollar amount. It’s about participation and being on board with Stetson and celebrating what’s going on,” she said. During the week of March 20, student philanthropy group Green, White & YOU will put large “price tags” in various campus locations, inside and outside of buildings, to show students the impact of donor funding in those areas. The group also plans a Snapchat scavenger hunt on Tuesday, March 21, with two winners receiving $100 gift cards as part of Tag Day. For example, tags will show that private donations are being raised for the renovation and expansion of the Carlton Union Building. The new Rinker Welcome Center was funded 100 percent by private donors through the campaign. And plans call for renovating the Edmunds Center, adding a new Center for Law Advocacy and Student Center at the College of Law in Gulfport, and a performance hall for the School of Music. Jeff Ulmer is Vice President of Development and Alumni Engagement at Stetson University. Renovations to the Edmunds Center are sorely needed and will add more comfortable seats, an LED scoreboard, video screens, a new lobby and a greater sense of excitement at events, Ulmer said. As part of the fundraising campaign, President Libby, academic deans, staff and others are meeting with alumni during Celebrate Stetson events, including ones in Fort Lauderdale and Jupiter this month and one in Atlanta next month. The meetings allow the university to develop relationships that yield not only donations, but also connections that open doors for Stetson students to find internships and jobs after graduation. The meetings have proven so beneficial that they will continue even after the $150 million goal is reached, Ulmer said, and can help fund future endeavors. President Libby emphasized that everyone can play a role in Stetson’s comprehensive campaign. “Everyone has the opportunity to be a part of the campaign and make a difference at Stetson. If you have something on campus you would love to support, you can restrict your gift to that particular program. Or you can give without restrictions and we will use the gift as annual support. My husband and I do both. Gifts from a few dollars a month to many millions of dollars all support our university,” she said.